Patients prone to heart disease may one day be told by physicians to avoid not only fatty foods and smoking but air pollution too. A new academic study led by UCLA researchers has revealed that the smallest particles from vehicle emissions may be the most damaging components of air pollution in triggering plaque buildup in the arteries, which can lead to heart attack and stroke. The findings appear in the Jan. 17 online edition of the journal Circulation Research. The scientists identified a way in which pollutant particles may promote hardening of the arteries — by inactivating the protective qualities of high density lipoprotein (HDL) cholesterol, known as "good" cholesterol. A multicampus team from UCLA, the University of Southern California, the University of California, Irvine, and Michigan State University contributed to the research, which was led by Dr. Andre Nel, UCLA's chief of nanomedicine. 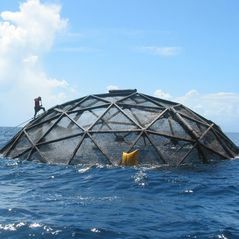 The study was primarily funded by the National Institute of Environmental Health Sciences and the U.S. Environmental Protection Agency (EPA). "It appears that the smallest air pollutant particles, which are the most abundant in an urban environment, are the most toxic," said first author Dr. Jesus Araujo, assistant professor of medicine and director of environmental cardiology at the David Geffen School of Medicine at UCLA. 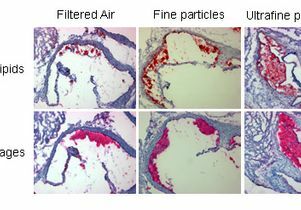 "This is the first study that demonstrates the ability of nano-sized air pollutants to promote atherosclerosis in an animal model." Nanoparticles are the size of a virus or molecule — less than 0.18 micrometers, or about one-thousandth the size of a human hair. The EPA currently regulates fine particles, which are the next size up, at 2.5 micrometers, but doesn't monitor particles in the nano or ultrafine range. These particles are too small to capture in a filter, so new technology must be developed to track their contribution to adverse health effects. 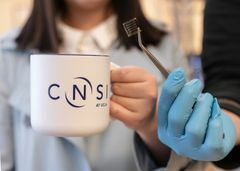 "We hope our findings offer insight into the impact of nano-sized air pollutant particles and help explore ways for stricter air quality regulatory guidelines," said Nel, principal investigator and a researcher at UCLA's California NanoSystems Institute. Nel added that the consequences of air pollution on cardiovascular health may be similar to the hazards of secondhand smoke. Pollution particles emitted by vehicles and other combustion sources contain a high concentration of organic chemicals that could be released deep into the lungs or even spill over into the systemic circulation. The UCLA research team previously reported that diesel exhaust particles interact with artery-clogging fats in low-density lipoprotein (LDL) cholesterol to activate genes that cause the blood-vessel inflammation that can lead to heart disease. In the current study, researchers exposed mice with high cholesterol to one of two sizes of air pollutant particles from downtown Los Angeles freeway emissions and compared them with mice that received filtered air that contained very few particles. The study, conducted over a five-week period, required a complex exposure design that was developed by teams led by Dr. Michael Kleinman, professor of community and environmental medicine at UC Irvine, and Dr. Constantinos Sioutas, professor of civil and environmental engineering at USC. Researchers found that mice exposed to ultrafine particles exhibited 55 percent greater atherosclerotic-plaque development than animals breathing filtered air and 25 percent greater plaque development than mice exposed to fine-sized particles. "This suggests that ultrafine particles are the more toxic air pollutants in promoting events leading to cardiovascular disease," Araujo said. Pollutant particles are coated in chemicals sensitive to free radicals, which cause the cell and tissue damage known as oxidation. Oxidation leads to the inflammation that causes clogged arteries. Samples from polluted air revealed that ultrafine particles have a larger concentration of these chemicals and a larger surface area where these chemicals thrive, compared with larger particles, Sioutas noted. "Ultrafine particles may deliver a much higher effective dose of injurious components, compared with larger pollutant particles," Nel said. Scientists also identified a key mechanism behind how these air pollutants are able to affect the atherosclerotic process. Using a test developed by Dr. Mohamad Navab, study co-author and a UCLA professor of medicine, researchers found that exposure to air pollutant particles reduced the anti-inflammatory protective properties of HDL cholesterol. "HDL normally helps reduce the vascular inflammation that is part of the atherosclerotic process," said Dr. Jake Lusis, study co-author and a UCLA professor of cardiology, human genetics and microbiology, immunology and molecular genetics. "Surprisingly, we found that exposure to air pollutant particles, and especially the ultrafine size, significantly decreased the positive effects of HDL." To explore if air particle exposure caused oxidative stress throughout the body — which is an early process triggering the inflammation that causes clogged arteries — researchers checked for an increase in genes that would have been activated to combat this inflammatory progression. "We found greater levels of gene activation in mice exposed to ultrafine particles, compared to the other groups," Lusis said. "Our next step will be to develop a biomarker that could enable physicians to assess the degree of cardiovascular damage caused by air pollutants or measure the level of risk encountered by an exposed person." Researchers added that previous studies assessing the cardiovascular impact of air pollution have taken place over longer periods of exposure time, such as five to six months. The current study demonstrated that ill effects can occur more quickly, in just five weeks. "Further study will pinpoint critical chemical and toxic properties of ultrafine particles that may affect humans," Nel said. The research team included investigators from the fields of nanomedicine, cardiology and genetics. Additional co-authors included Berenice Barajas, Xuping Wang, Brian J. Bennett and Ke Wei Gong of the David Geffen School of Medicine at UCLA, and Jack Harkema from the department of pathobiology and diagnostic investigation at Michigan State University. Additional grant support was provided by the National Institute of Allergy and Infectious Diseases; the National Heart, Lung and Blood Institute; and the Robert Wood Johnson Foundation.